A few days ago, Dell unveiled its new Latitude 7400 2-in-1 notebook. 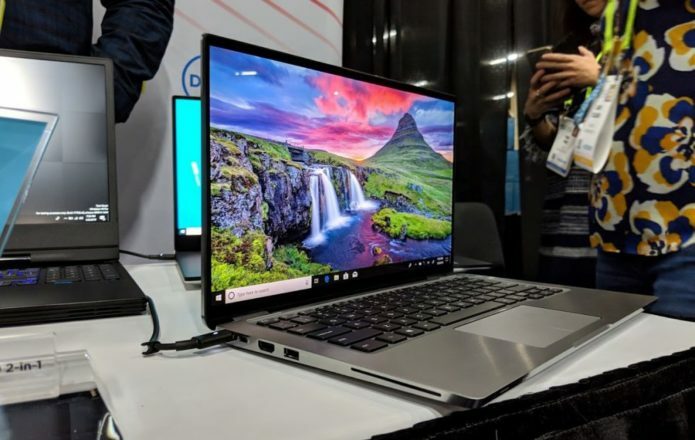 The company brought the Latitude 7400 along with it to CES 2019, giving us the opportunity to have a look at it in-person. The laptop itself is pretty sleek in its design, and it’s meant to be a highly portable machine, as it only weighs in at three pounds with a total thickness of 14.89mm. Despite that relatively light weight, we’re still getting a 14-inch full HD display on the Latitude 7400. Perhaps more impressive, however, is the Latitude’s security features, which offer proximity sign-in through Windows Hello. This means that your computer will wake from sleep when you walk up to it and lock itself when you walk away, though as you can see from the photos, you can also lock and unlock your device with the fingerprint scanner that’s taken up residence to the right side of the keyboard.